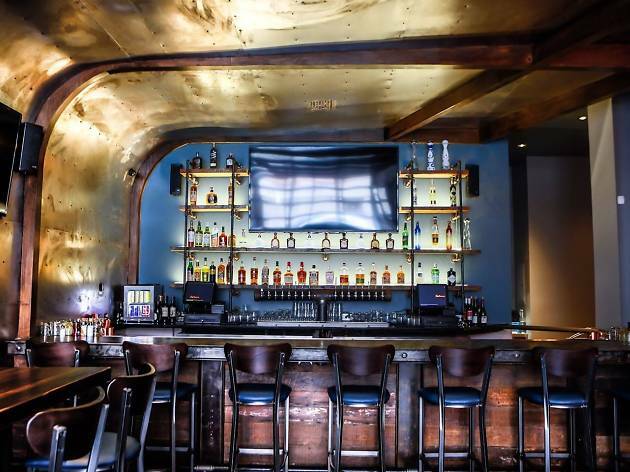 This River North sports bar with a steampunk vibe serves hearty New American bar food that's heavy on the seafood, like crab quesedillas and lobster tater tots, craft cocktails and craft brews in a nautical inspired space. If you're looking to watch the Bulls, Blackhawks, Iowa Hawkeyes or Patriots, you can catch the games here on one of their 23 TVs. El: Brown, Purple to Merchandise Mart. Bus: 65, 156. The owners of Flagship have done it yet again! 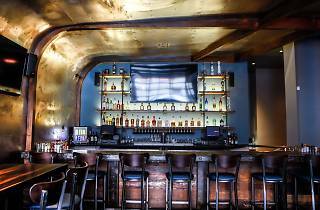 Ironside Bar and Galley located in the heart of River North is definitely worth trying. The nautical ambience adds a cool vibe while diners munch on a seafood-centric menu and sip on a big selection of craft brews and ciders. My lobster BLT was the perfect choice - not only were they generous on the lobster but the sandwich itself was on light and fluffy brioche which added the perfect subtle sweetness. We also tried the brisket sliders which were perfectly tender and delicious. While Ironside is definitely a sports bar, boasting TVs on every wall, they've got a DJ spinning most Friday and Saturday nights... definitely worth a try! I have been to Ironside a couple times now and each time was quite different. I've been twice for brunch and the food was great. The second time the waitress forgot to enter our order so I had to take my food to go but otherwise it was good. I recently went for a friends birthday and even though it was busy the waitress was on top of our orders and checked on us frequently. The food is delicious and has an east coast vibe. The mac and cheese is amazing and the burger sliders were some of the best I've had. Working in River North can be a drag when it comes to lunch options in terms of crowds and trying to be "healthier" but GT Fish & Oyster is where it's at! Beautiful ambiance during the day (can't wait to see it in the evening). I went with a couple coworkers so I was able to try several lunch menu dishes, all of which I was super impressed by. The tuna poke was awesome, although it was my first time trying this new "it" food but what I can say that I liked about it was how fresh the fish tasted and the cucumber added a nice crunch while the mango brightened up the dish. The shishito pepper's were AMAZING. I have only had a shishito dish at GT's bread winner cousin, Girl & the Goat but this light twist with fresh watermelon and crab was DELISH! I really enjoyed the mild chile with the slightly sweet watermelon and the cilantro brought everything full circle. As my entree I had the seared tuna nicoise salad which is served on boston bibb lettuce with a very mild mustard seed dressing. The seared tuna was complimented well with hard boiled egg and red potatoes. Very light and summery leaving you wishing for the sea but not dreading going back to work with a full belly. Oysters are BOMB, will be hitting up their happy hour sometime in the near future for half price oysters and cocktails at the bar.